Meerlust is something of a peculiar name that, in Afrikaans describes the pleasure obtained from the sea breezes that blow inland from the False Bay (which is only 5km away) over the farm. 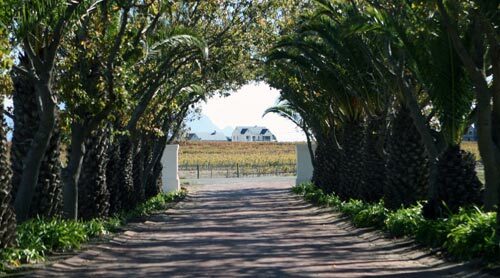 Needless to say, it’s an old name that dates back to 1693 when the land was originally granted to a man named Henning Hüsing and was one of the first 12 estates in Stellenbosch. In 1757 Johannes Albertus Myburgh bought the estate and since then, it has remained in the possession of the Myburgh family with eighth generation, Hannes Myburgh as the current winemaker. On the 110 hectares of vineyards, they grow Chardonnay, Cabernet Sauvignon, Cabernet Franc, Merlot, and Pinot Noir. The old, original buildings (one of which is a national monument) are at the heart of the winery giving it wonderful charm that is enhanced by the palm-lined driveway and winery dogs lounging about the premises, soaking in the sun.